Polish rabbi; born in Lodmir or Vladimir, Volhynia, about 1586 (see Grätz, "Gesch." x. 57, and "Ḳin'at Soferim," p. 48b, note 809); died in Lemberg Jan. 31, 1667. 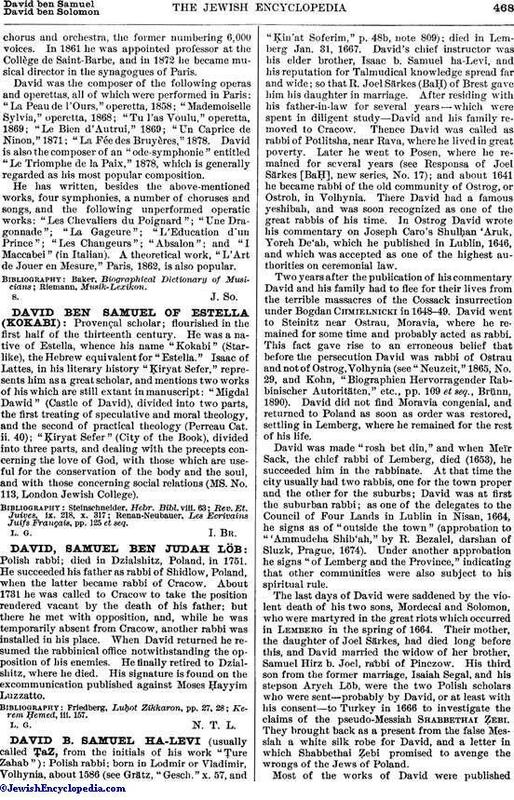 David's chief instructor was his elder brother, Isaac b. Samuel ha-Levi, and his reputation for Talmudical knowledge spread far and wide; so that R. Joel Särkes (BaḤ) of Brest gave him his daughter in marriage. After residing with his father-in-law for several years—which were spent in diligent study—David and his family removed to Cracow. Thence David was called as rabbi of Potlitsha, near Rava, where he lived in great poverty. Later he went to Posen, where he remained for several years (see Responsa of Joel Särkes [BaḤ], new series, No. 17); and about 1641 he became rabbi of the old community of Ostrog, or Ostroh, in Volhynia. There David had a famous yeshibah, and was soon recognized as one of the great rabbis of his time. In Ostrog David wrote his commentary on Joseph Caro's Shulḥan 'Aruk, Yoreh De'ah, which he published in Lublin, 1646, and which was accepted as one of the highest authorities on ceremonial law. Two years after the publication of his commentary David and his family had to flee for their lives from the terrible massacres of the Cossack insurrection under Bogdan Chmielnicki in 1648-49. David went to Steinitz near Ostrau, Moravia, where he remained for some time and probably acted as rabbi. This fact gave rise to an erroneous belief that before the persecution David was rabbi of Ostrau and not of Ostrog, Volhynia (see "Neuzeit," 1865, No. 29, and Kohn, "Biographien Hervorragender Rabbinischer Autoritäten," etc., pp. 109 et seq., Brünn, 1890). David did not find Moravia congenial, and returned to Poland as soon as order was restored, settling in Lemberg, where he remained for the rest of his life. 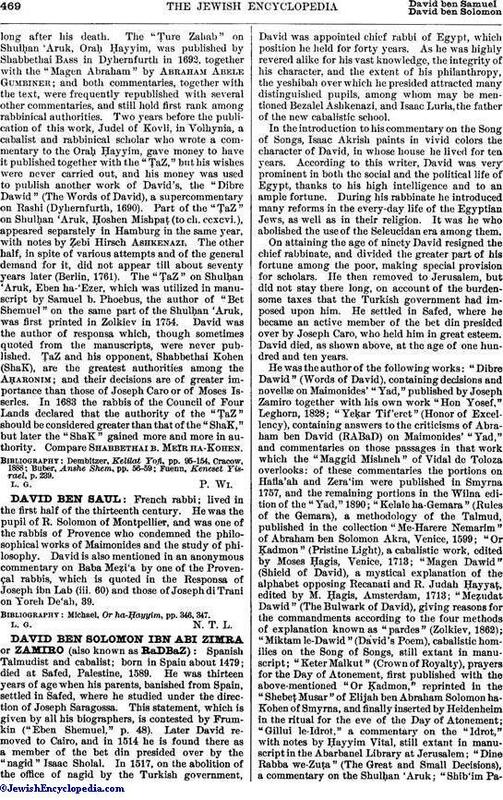 David was made "rosh bet din," and when Meïr Sack, the chief rabbi of Lemberg, died (1653), he succeeded him in the rabbinate. At that time the city usually had two rabbis, one for the town proper and the other for the suburbs; David was at first the suburban rabbi; as one of the delegates to the Council of Four Lands in Lublin in Nisan, 1664, he signs as of "outside the town" (approbation to "'Ammudeha Shib'ah," by R. Bezalel, darshan of Sluzk, Prague, 1674). Under another approbation he signs "of Lemberg and the Province," indicating that other communities were also subject to his spiritual rule. The last days of David were saddened by the violent death of his two sons, Mordecai and Solomon, who were martyred in the great riots which occurred in Lemberg in the spring of 1664. Their mother, the daughter of Joel Särkes, had died long before this, and David married the widow of her brother, Samuel Hirz b. Joel, rabbi of Pinczow. His third son from the former marriage, Isaiah Segal, and his stepson Aryeh Löb, were the two Polish scholars who were sent—probably by David, or at least with his consent—to Turkey in 1666 to investigate the claims of the pseudo-Messiah Shabbethai ẓebi. They brought back as a present from the false Messiah a white silk robe for David, and a letter in which Sbabbetbai Ẓebi promised to avenge the wrongs of the Jews of Poland. Most of the works of David were publishedlong after his death. The "Ṭure Zahab" on Shulḥan 'Aruk, Oraḥ Ḥayyim, was published by Shabbethai Bass in Dyhernfurth in 1692, together with the "Magen Abraham" by Abraham Abele Gumbiner; and both commentaries, together with the text, were frequently republished with several other commentaries, and still hold first rank among rabbinical authorities. Two years before the publication of this work, Judel of Kovli, in Volhynia, a cabalist and rabbinical scholar who wrote a commentary to the Oraḥ Ḥayyim, gave money to have it published together with the "ṬaZ," but his wishes were never carried out, and his money was used to publish another work of David's, the "Dibre Dawid" (The Words of David), a supercommentary on Rashi (Dyhernfurth, 1690). Part of the "ṬaZ" on Shulḥan 'Aruk, Ḥoshen Mishpaṭ (to ch. ccxcvi. ), appeared separately in Hamburg in the same year, with notes by Ẓebi Hirsch Ashkenazi. The other half, in spite of various attempts and of the general demand for it, did not appear till about seventy years later (Berlin, 1761). The "ṬaZ" on Shulḥan 'Aruk, Eben ha-'Ezer, which was utilized in manuscript by Samuel b. Phoebus, the author of "Bet Shemuel" on the same part of the Shulḥan 'Aruk, was first printed in Zolkiev in 1754. David was the author of responsa which, though sometimes quoted from the manuscripts, were never published. ṬaZ and his opponent, Shabbethai Kohen (ShaK), are the greatest authorities among the Aḥaronim; and their decisions are of greater importance than those of Joseph Caro or of Moses Isserles. In 1683 the rabbis of the Council of Four Lands declared that the authority of the "ṬaZ" should be considered greater than that of the "ShaK," but later the "ShaK" gained more and more in authority. Compare Shabbethai B. Meïr Ha-Kohen. Fuenn, Keneset Yisrael, p. 239.